Dr. Mance worked as a Specialist Surgeon in the General Surgery Department and Endoscopy Unit at Al Rashid Hospital (1987 – 2003). 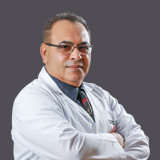 He joined thereafter as a Specialist Surgeon and early detection of breast cancer program in Al Elwiya Teaching Hospital, Baghdad (2003 – 2007). Dr. Mance also worked as Specialist Surgeon and Medical Director in MMC, and EIH, as well as the Colorectal Department in Piedmont Hospital , Atlanta, USA, giving him an overall of 27 years of experience in General & Laparoscopic Surgery. Dr. Mance acquired the Certificate of the Arab Board of Medical Specialization in General Surgery (1997). Dr. Hazem speaks Arabic and English. Learn How To Manage The Scale In Your Life With These 6 Tips! What's new in nmc Surgery?